The Pegula Ice Arena is going to be an attraction for college hockey recruits and fans at Pennsylvania State University as the Nittany Lions look to build off their first year in their new home. The 90 million dollar facility donated by Buffalo Sabres owner Terry Pegula features many amenities for the team’s hockey players and staff including a team lounge, video and study room and a 5,000 foot strength and conditioning center. 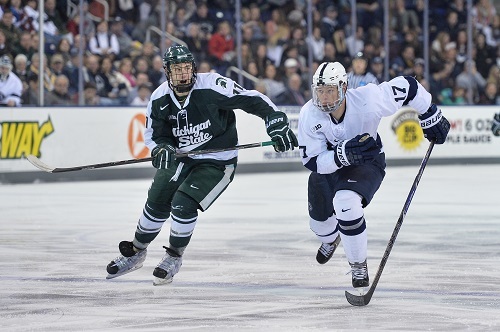 Washington Capitals defensive prospect Patrick Koudys experienced Penn State’s first year at the Pegula Ice Arena and PSU’s first season in the Big Ten last year and is set to finish his collegiate career in the 2014-15 campaign as a senior at State College. Koudys hopes to bring his leadership qualities to the locker room as Captain of the Nittany Lions this season, taking over for senior forward Tommy Olcyzk. At 6’3”, 210 pounds, Koudys is an imposing presence from the blue line and plays to his physical dimensions. He’s a shutdown defenseman who finished fourth in Big Ten with 79 blocked shots. The Ontario native recently participated in his second development camp with the Washington Capitals as he nears the jump from the NCAA to the pro game. The bruiser from the PSU defense saw pointed changes in the strategy from new head coach Barry Trotz and Capitals management compared to last season’s development camp, led by former Capitals star and head coach Adam Oates. While there’s no certainty of where he’ll play next season, Koudys isn’t looking too far ahead. He wants to improve on his skating among other aspects of his game as he enters his senior year at the collegiate level. Koudys was selected by the Capitals in the fifth round of the 2011 NHL entry draft and has produced 13 points (four goals, nine assists) in 94 collegiate contests. He played two seasons at Rensselaer Polytechnic Institute (RPI) prior to transferring to Penn State University. The Capitals have many young talented offensive defensemen in their system including Madison Bowey, Connor Carrick and Nate Schmidt, but there’s a lack of shutdown blue liners. 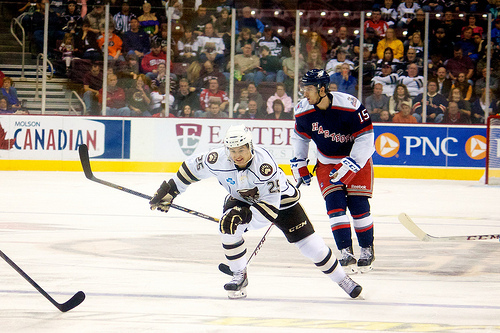 Koudys could sign an AHL deal with the Hershey Bears like Garrett Haar did for the 2014-15 campaign if the Capitals are reluctant to give him an entry level contract after this season. Koudys understands that and is focused at school right now. There’s a culture of community already at Penn State in their hockey program, which will continue to grow and attract talent as their time goes on in the Big Ten. Having a state of the arc facility like the Pegula Ice Arena and a strong academic background doesn’t hurt either.